I’m on a culinary journey for this post, and you’re invited to come along! I was reading a historical cooking blog. And the author mentioned he and his fiancée were visiting an antique goods store. While there, he asked the shop owner about a certain cheese. It was called Mimolette, and apparently this cheese was a special kind of cheese, known only in the circles of cheese connoisseurs, or turophiles as they are called. Turophiles is a new word I learned. Doesn’t it sound sophisticated? This cheese is originally from France (as might be expected by the fancy name). And you may be surprised it looks just like a cantaloupe not only on the outside, with that rough crust, but also on the inside with a dark orange color! In fact, if this cheese and a cantaloupe weren’t labeled, and set side by side, I bet it would be easy to confuse one with the other. Many people say the taste of mimolette cheese is much like Dutch Gouda cheese, or like Parmesan cheese when it is not fully aged. Although mimolette is from France, the idea, recipe, or style (if you will), was copied from a Dutch cheese named Edammer. But the most interesting aspect of mimolette cheese is yet to come! And now you will find out why it was banned from the United States. The flavor and texture of the cheese is made by cheese mites (little bugs) that are put in the cheese to create the rough crust and age the cheese by their eating activity. So if you eat mimolette cheese, you are eating cheese with bugs in it! Did you know there are quite a few other cheeses with mites in them? Yet the mimolette supposedly has more mites than other cheeses. So recently this year, the FDA thought mimolette just had one-too-many mites, which made it “filthy” and quite gross, so they banned any imports of this cheese in the United States, and destroyed cheeses that were still available in stores here. This caused some people to protest and put up campaigns to “Save the Mimolette”, but they didn’t win the battle and Mimolette is still rejected by American authorities, while some American cheese connoisseurs mourn after it. So if you ever go to Europe and visit France, remember to try some Mimolette! That is, if you’re not grossed out by the mitey cheese! 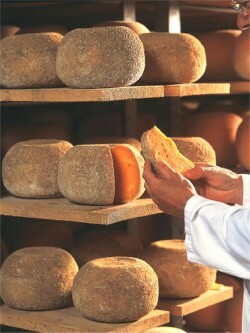 Question to all readers: Would you taste/eat Mimolette cheese if you were given some, now that you know it has mites? I guess you know by now that Mimolette is available again in the States, just with the outer portion of the rind (where almost all of the mites are found) removed. Really?? I didn’t know that, thank you for the information! I think I would try it too, because I love cheese.